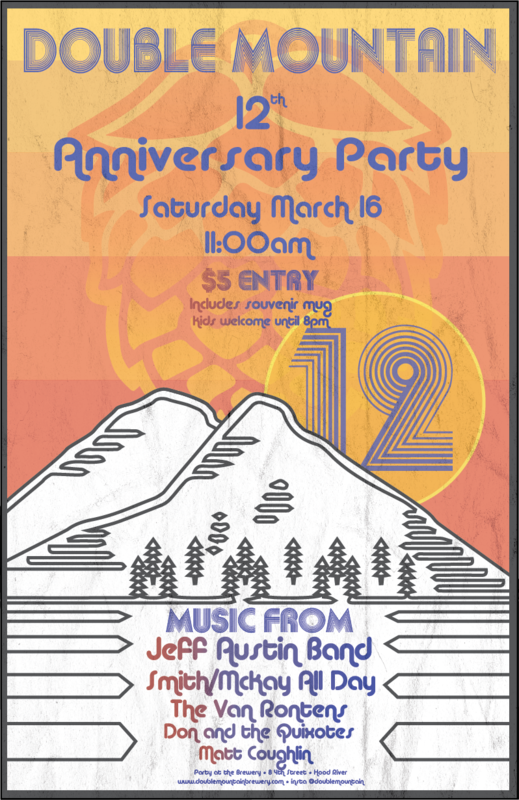 One dozen years strong, Double Mountain Brewery will celebrate its 12th Anniversary in Hood River on Saturday, March 16, 2019. This daylong celebration that kicks off at 11:00am will include some great craft beer and live music headlined by the Jeff Austin Band, formerly of Yonder Mountain String Band. To keep the beers flowing, Double Mountain will have three bars pouring an impressive 28 different offerings from Double Mountain Brewery. Quite a few will be beers from its Brewers’ Reserve series. Admission is $5.00 for adults and includes a souvenir mug. Kids are welcome with a parent or guardian until 9:00pm.